A new direction has been confirmed for the landmark Vancouver condo tower at the Jameson House. 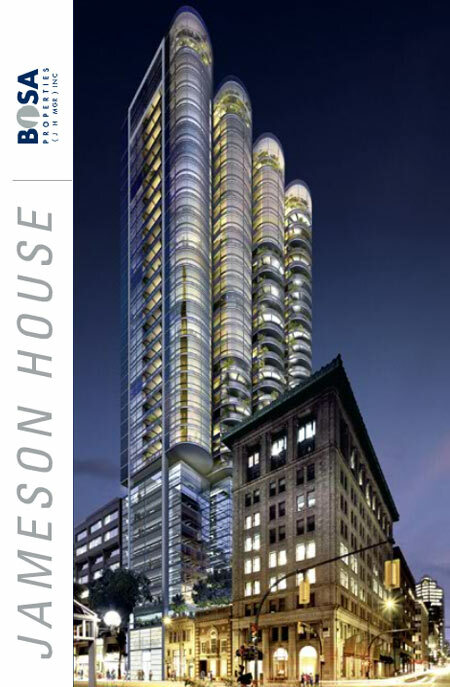 Bosa Properties is proud to announce that they will be the director of Jameson House Vancouver condo development. Complementing the Vancouver real estate skyline with a stunning and truly iconic condominium tower is Bosa Properties, who takes over for the completion of the much anticipated and highly sought after Jameson House Vancouver downtown condo high-rise. This is a new architectural icon designed by Foster and Partners Architects, world renowned for their striking buildings throughout the globe. The BOSA Properties Jameson House Vancouver landmark condo building is Foster and Partners Architects’ first residential condo offering in all of North America and will truly redefine the downtown Vancouver real estate skyline for decades to come. The pure interiors of these ultra luxury Vancouver condos for sale are also designed by Foster and Partners Architects and with finishings that come imported from the United Kingdom, Germany, Italy and the United States, there is no other new landmark condo tower offering such as the Jameson House by Bosa Properties. Residents at this premier offering downtown will also have exclusive membership to the Terminal City Club! The building site is at 838 West Hastings, and with this ideal locatin comes convenience to local shopping, high-end restaurants, nightlife, entertainment, recreational facilities, the waterfront and perfect views. Some of the marketing from the new BOSA Properties Jameson House Vancouver condo project includes: Welcome to the Jameson House, a North American first for Foster and Partners Architects. Disciplined and beautiful the architecture of the downtown Vancouver landmark condo tower is beyond luxury. This is a modern residential art. The Bosa Properties Jameson House Vancouver condominiums feature 138 suites only over floors 14 to 36, offering numerous floor plans that range in size between 600 and 3600 square feet. A stunning example of vibrant urban living, the Jameson House Vancouver condos by Bosa properties and designed by Foster and Partners Architects champions sustainable design with its innovative mix of retail, office and residential spaces for discerning homebuyers. Designed for the future, while honouring the past, the downtown Vancouver Jameson House condos for sale offer the city a new legacy of undulating lines, pure interiors, sweeping views and exclusive amenities that are unmatched by any other Vancouver real estate development. 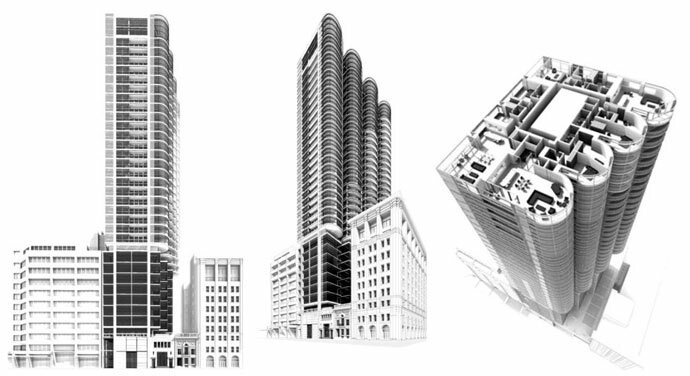 Here are some of the features and finishes proposed by Foster and Partners Architects and Bosa Properties for the iconic Jameson House Vancouver luxury condo tower suites. With over height, nine foot ceilings, the spaces are airy and bright. Imported travertine Osso stone flooring throughout these Jameson House Vancouver luxury condos are standard with high quality carpets in the bedrooms. Place kitchen designed by Foster and Partners for Dada Cucina of Italy and the finest quality window shades with woven sun control fabric are standard in every home. All shade material throughout the Bosa Properties Jameson House Vancouver condo tower is the same to create a unified appearance inside and out. The ‘Place’ kitchen at the Jameson House condos for sale are designed by Foster and Partners for Dada Cucina of Italy, available in two finish palettes with a kitchen island (stationary and moveable) in some suites. The cool white theme at the new Vancouver Jameson House condos features polished white glass with travertine stone flooring. The warm natural theme has natural oak panels with travertine stone floors. Custom stainless steel counters, stainless steel backsplash with built in illuminated glass lighting panel, integrated sinks, hidden integrated power outlets, Dornbracht pull and spray kitchen faucet from Germany and Gaggenau appliance package with Sub-Zero fridge/freezer and Bosch washer/dryer end out the standard features at the luxury Vancouver condos for sale at the Jameson House tower by Bosa Properties. The bathrooms and powder rooms at the luxury Vancouver Jameson House condominiums feature the same two colour palettes for homebuyers to choose from and include imported oversized stone floors/tiling and a built in frameless mirrored vanity units. Some of the master ensuite features at the Bosa Properties Jameson House Vancouver luxury condos for sale include stone decks and tub surround, separate frameless glass walk in showers with stainless steel floor grills or integrated bath and shower in addition to Dornbracht faucets from Germany. There are Foster and Partners designed wall hung concealed tank toilet from Duravit in Germany in addition to bathrooms accessories by Hansgrohe Axor steel range. Other standards at the luxury Jameson House Vancouver condominiums for sale include Hansgrohe rain shower head with separate handheld shower spray, Foster designed wall hung basins from Duravit Germany and Turkish marble. Some of the incredible technology upgrades that home buyers can choose from for their new downtown Vancouver Jameson House condominium suite by Commercial Electronics include such things as: distributed audio package, home media room option, distributed media options, home control integration option, smart climate control option and security option. There is also a motorized window treatment optional upgrade here at the downtown Vancouver Jameson House condo tower residences. Remember that the Jameson House Vancouver real estate development is a mixed-use project that has a residential component to it. This is a sustainable community designed by Foster and Partners Architects for long term sustainability. The ambition for Foster and Partners has been to refer to, rather than defer to the historic legacy of the area, creating symbiotic schemes where the old inspires the new, and the new enriches the old. As a residential Vancouver downtown condo building that is very close to the business district, shops and recreational options, Jameson House Vancouver luxury condos for sale is an ideal model for sustainable urban condo living. As carbon emissions resulting from transport are largely removed, the residents at the luxury Jameson House tower residences should be able to walk to everything within the community. Mixed use development also presents a strong case for energy balance, with residential components using energy at different times to office and retail buildings. By combining a mix of uses, the Jameson House Vancouver condo building will pioneer sustainable architecture and will reinforce the economic and social activity of the area by bringing new retail, services and existing businesses to its residents. Some of the sustainable features of the Jameson House condo tower includes ambient office light controls that offer energy savings up to 40%. In addition, the water use is minimized throughout the high-rise tower with low waste systems and water efficient appliances/fixtures. A high performance condominium building envelope minimizes unwanted solar gains and heat loss through the seasons. There is also a passive thermal system and free cooling, natural ventilzation within the Bosa Properties Jameson House Vancouver tower in addition to mixed use sharing of heating, cooling and electricity. Designed for LEED certification upon completion, the downtown Vancouver Jameson House condo tower residences will also feature under floor radiant heating and cooling systems that is silent, energy efficient, clean and healthy. The translucent stone entry way with double height ceilings will greet you and your guests to the Jameson House landmark Vancouver condo tower. The modern lobby and common areas are pristine, minimalist and very modern and there will be a 24 hour concierge available to residents. Security is of utmost importance, and the downtown Vancouver Jameson House condo tower will feature electronic access through all main doors, common areas and restricted floor access through high speed elevators. Some other amenities presented at the luxury Vancouver condos at the Jameson House by Bosa Properties includes a membership to the Terminal City Club that includes the following features: room service/catering, housekeeping services (optional), dining rooms/pub, meeting/banquet rooms, massage/spa services, games room, billiards room, library/reading room, affiliations to other organizations and recreational style businesses, guest privileges and much more. The 15800 square foot Terminal City Club Fitness Centre that is available to the downtown Vancouver Jameson House condo residents includes three international sized squash courts, stunning glass topped 25 metre ozonated indoor swimming pool, whirlpool, steam room, saunas, and outdoor terrace deck with great views. Closer to home, the downtown Jameson House Vancouver condo tower will also present a media room, large boardroom, strata meeting room and recycling room. One of the very cool and modern features of the Jameson House condominium tower is the automated parking and bike storage. The Jameson House Vancouver condo building will feature an innovative and clearly high tech automated parking system that will essentially park your car for you. It is double gated and full secured. For more information about the new Vancouver landmark condos at The Jameson House, please visit the Bosa Properties’ presentation centre at 830 West Pender Street, Vancouver, BC. It is open noon to 6pm every day. You can also call 604.339.0707 or 1.888.339.0707 at any time to book a private appointment. The Jameson House Vancouver landmark condo website is located at jamesonfoster.com.